Trading on the Main Market of the Jamaica Stock Exchange on Wednesday as 26 securities changed hands, resulting in 14,655,576 units valued at $227,353,346 trading. 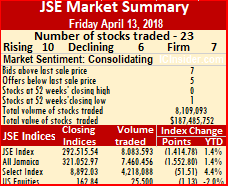 The main market closed with 11 securities rising, 11 declining and 4 trading firm, leading to the JSE All Jamaican Composite Index falling 1,060.23 points to 325,702.82 and the JSE Index declined by 965.99 points to 296,752.08. In market activity, Barita Investments closed at $10.25, with 1,025 shares, after adding 25 cents, Berger Paints lost 10 cents and ended at $19, with 10,656 stock units, Carreras fell 5 cents and concluded trading at $10.75, with 4,337,080 units, Caribbean Cement jumped $1.51 and finished at $38.51, with 66,979 shares, Ciboney Group declined by 2 cents and settled at 12 cents, with 2,161,849 units. 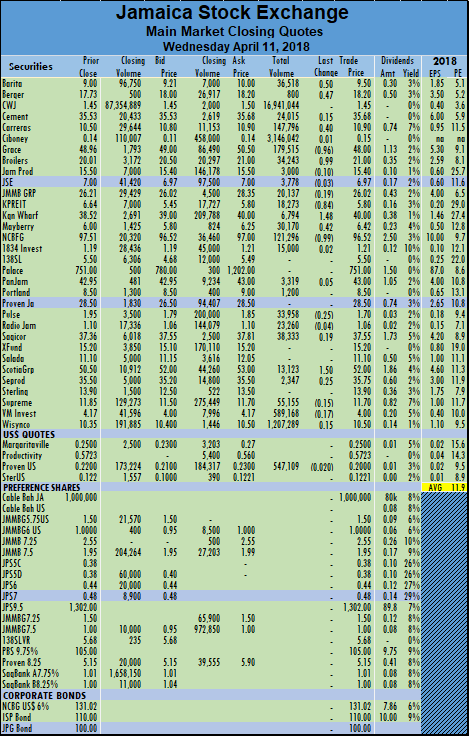 Grace Kennedy ended trading with a loss of 51 cents at $48.50, with 35,620 shares, Jamaica Broilers gained 90 cents in traded 14,955 stock units to end at $21, Jamaica Producers finished trading at $16.50, with 1,044,013 units, Jamaica Stock Exchange lost 10 cent and closed at $6.90, with 1,260 shares. JMMB Group dropped $1.08, ending at $27.25, with 170,021 shares, Kingston Wharves dropped $3 and finished at $46, with 15,000 stock units, Mayberry Investments settled at $6.05, for a rise of 3 cents, with 108,012 units, NCB Financial Group climbed $1.40 to $96.50, with 46,142 shares. 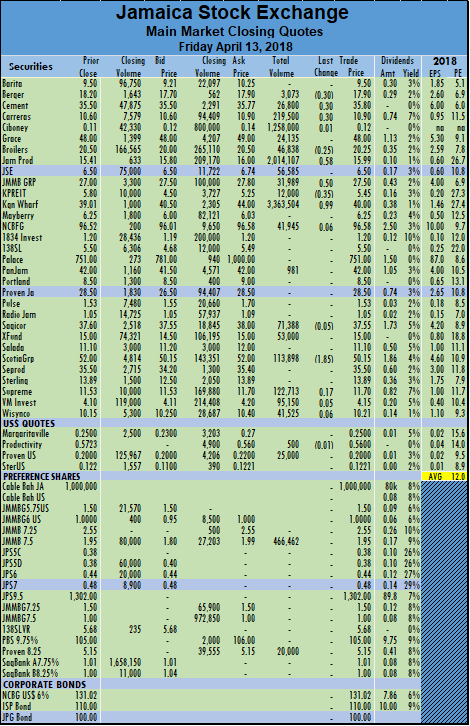 1834 Investments closed trading at $1.15, with 81,945 shares, PanJam Investment lost 1 cent and closed at $44, with 72,100 stock units, Pulse Investments concluded trading at $1.79, after falling 1 cent with 108,000 shares, Sagicor Group fell 49 cents and settled at $37.50, with 25,985 shares and Sagicor Real Estate Fund settled at $15, with a rise of 99 cents trading 17,835 shares. Salada Foods gained 5 cents and ended trading at $11.20, with 43,684 stock units, Scotia Group jumped $1.79 to $51.99, with 1,959,155 units, Seprod climbed $1 and finished trading at $35, with 25,820 shares, Supreme Ventures ended at $11.75, up 5 cents with 527,887 shares. Victoria Mutual Investments concluded trading at $4.06, after rising 31 cents with 357,576 stock units and Wisynco Group finished at $10.90, with 3,412,434 units changing hands. 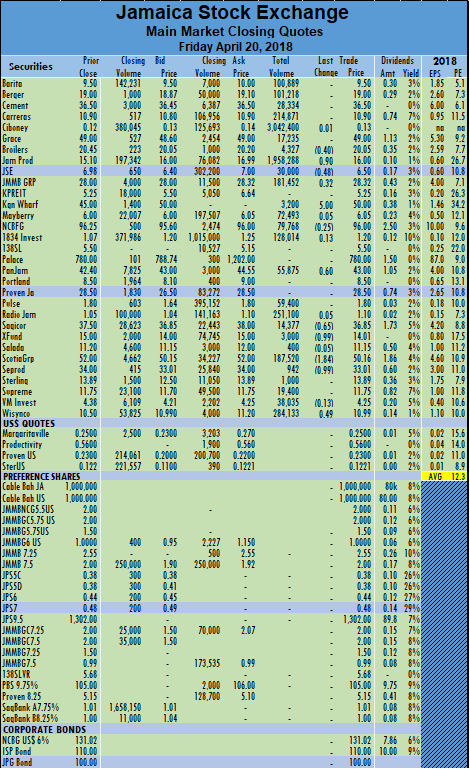 In the main market preference segment, Jamaica Money Market 7.5% traded 2,138 stock units at $1.92 and JMMB Group closed at 99 cents, with 8,405 shares changing hands. 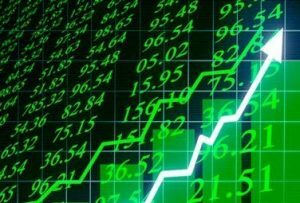 Trading levels rose on the Main Market of the Jamaica Stock Exchange on Monday but remained moderate with an average of only 156,653 units valued at $3,187,757 for each security trading. At the close of trading, 23 securities changed hands, resulting in 6,877,671 units valued at $68,979,399 trading, up sharply from the 2,507,681 units valued at only $38,468,870 on Friday. The main market closed with 9 securities rising, 7 declining and 7 trading firm, leading to the JSE All Jamaican Composite Index increasing by 1,415.92 points to end at a record close of 327,594.70 and the JSE Index rising 1,290.06 points to a new closing record of 298,475.80. In market activity, Barita Investments closed at $9.50, with 33,268 shares, Berger Paints rose 10 cents and ended at $19.10, with 4,237 stock units, Carreras concluded trading at $10.90, with 1,171,484 units, Caribbean Cement finished at $36.50, with 64,512 shares, Grace Kennedy rose 65 cents and ended trading at $49.65, with 6,186 shares. Jamaica Broilers rose 45 cents to $20.50, with 570,105 stock units, Jamaica Producers ended with a rise of 99 cents at $16.99, with 12,676 units, Jamaica Stock Exchange rose 2 cents and closed at $6.52, with 2,350 shares, JMMB Group lost $1.10 to closed at $27.22, as some selling came into the market for the stock, and ended with 1,208,947 shares changing hands. Kingston Wharves lost 5 cents and finished at $49.95, with 2,471 stock units after it traded at an intraday high of $51, Mayberry Investments settled at $6.05, with 20,200 units, NCB Financial Group rose $1 and ended trading at $97, with 76,990 shares, 1834 Investments lost 5 cents, to end at $1.15, trading 18,055 shares. PanJam Investment rose $1.45 to $44.45 trading 2,522 stock units, Sagicor Group settled at $36.85, with 15,203 shares and Sagicor Real Estate Fund gained 99 cents to end at $15, with 6,365 shares. Scotia Group climbed $1.34 to $51.50, with 30,645 units, Seprod finished trading at $33.01, with 427 shares, Supreme Ventures fell 5 cents and ended at $11.70, with 36,109 shares, Victoria Mutual Investments concluded trading at $4.21, after slipping 4 cents with 218,181 stock units, Wisynco Group fell 9 cents and finished at $10.90, with 95,232 units. 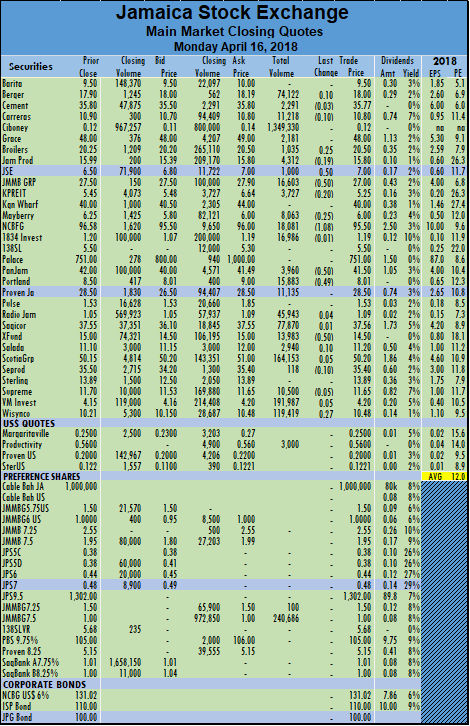 In the main market preference segment, Jamaica Money Market 7.25% ended trading at $2.55, with 500 shares and Jamaica Money Market 7.5% traded at $1.92, with 6,364 stock units, changing hands. Kingston Wharves pushes JSE to new record. 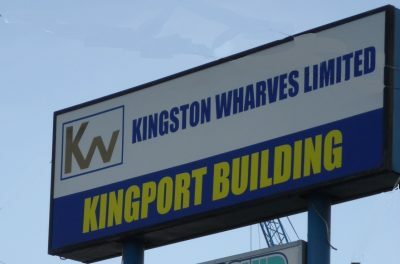 Kingston Wharves jumped $5 to a record close at $50 on Friday. Kingston Wharves jumped $5 and ended at a record high of $50 on modest volume and helped to push the market to new highs on Friday. On Tuesday, the price jumped $5, to the then new high of $45. 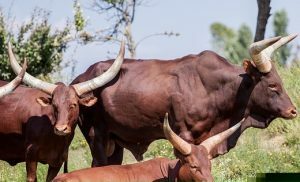 Scarcity seems the main factor behind the sharp rally in so short a time frame with 94 percent of the 1.347 billion shares held by the top 10 shareholders. Kingston Wharves close trading with the bid to buy 1,400 units at $50 and no stock being offered. This stock is ideal for a split with more than the relatively high price and limited supply. 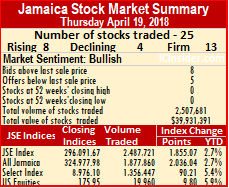 Trading levels rose on the Main Market of the Jamaica Stock Exchange on Friday but remained moderate with an average of only 264,526 shares valued at $2,653,054 each trading. At the close 26 securities changed hands, resulting in 6,877,671 units valued at $68,979,399 trading compared to 2,507,681 units valued at $38,468,870 on Thursday. 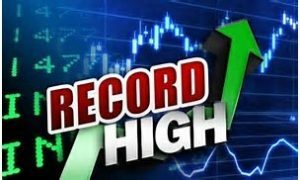 The main market closed with 9 securities rising, 9 declining and 8 trading firm, leading to the JSE All Jamaican Composite Index increasing by 1,200.80 points to end at a record close of 326,178.78 and the JSE Index rising 1,094.07 points to a new closing record of 297,185.74. In market activity, Barita Investments closed at $9.50, with 100,889 shares, Berger Paints ended at $19, with 101,218 stock units, Carreras concluded trading at $10.90, with 214,871 units, Caribbean Cement finished at $36.50, with 28,334 shares, Ciboney Group rose 1 cents and settled at 13 cents, trading 3,042,400 shares. Grace Kennedy ended trading at $49, with 17,235 shares, Jamaica Broilers fell 40 cents to close at $20.05, trading 4,327 stock units, Jamaica Producers climbed 90 cents and finished trading at $16, with 1,958,288 units, Jamaica Stock Exchange fell 48 cents and closed at $6.50, with 30,000 shares. JMMB Group ended at $28.32, after gaining 32 cents with 181,452 shares trading, Kingston Wharves jumped $5 and finished at $50, with an exchange of 3,200 stock units, Mayberry Investments settled with a gain of 5 cents at $6.05, with 72,493 units, NCB Financial Group fell 25 cents and ended trading at $96, with 79,768 shares. 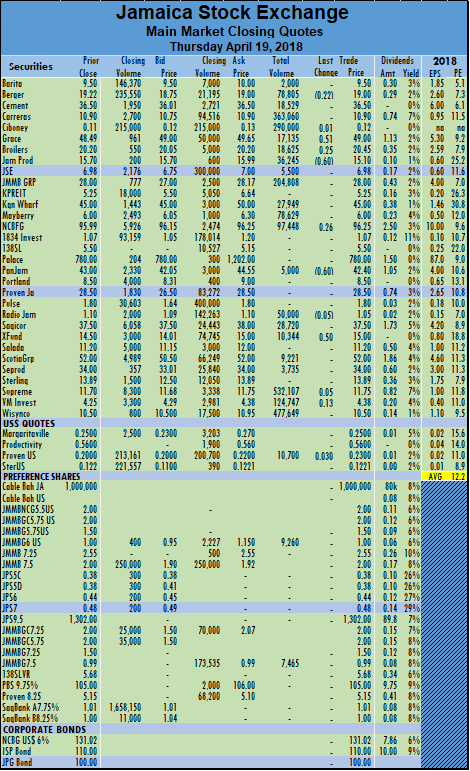 1834 Investments traded with a gain of 13 cents at $1.20, with 128,014 shares, PanJam Investment climbed 60 cents and closed at $43, with 55,875 stock units, Pulse Investments concluded trading at $1.80, with 59,400 shares, Radio Jamaica rose 5 cents finished at $1.10, with 251,100 shares. Sagicor Group settled dropped 65 cents and landed at $36.85, with 14,377 shares and Sagicor Real Estate Fund lost 99 cents to settled at $14.01, with 3,000 shares changing hands. Salada Foods fell 5 cents to $11.15, with 400 stock units, Scotia Group lost $1.84 to $50.16, with 187,520 units trading, Seprod finished trading with a loss of 99 cents at $33.01, after trading 942 shares. Sterling Investments closed at $13.89, with 1,000 shares, Supreme Ventures ended at $11.75, with 19,400 shares, Victoria Mutual Investments concluded trading at $4.25, with a loss of 13 cents in exchanging 38,035 stock units and Wisynco Group rose 49 cents and finished at $10.99, with 284,133 units changing hands. Trading volumes rose but the total sum traded declined on the Main Market of the Jamaica Stock Exchange on Thursday with 4,971,238 units valued at $81,421,271 changing hands compared to 3,313,428 units valued at $132,584,977 on Wednesday. The main market closed with just 23 securities changing hands, of which 16 rose, 4 declined and 3 traded firm leading to the JSE All Jamaican Composite Index surged 2,036.04 points to 324,977.98 and the JSE Index jumped 1,855.07 points to 296,091.67. In market activity, Barita Investments closed at $9.50, with 2,000 shares trading, Berger Paints fell 22 cents and ended at $19, with 78,805 stock units, Carreras concluded trading at $10.90, with 363,060 units, Caribbean Cement finished at $36.50, with 18,529 shares, Ciboney Group rose 1 cent to close at 12 cents, with 290,000 shares. Grace Kennedy gained 51 cents and ended trading at $49, with 17,135 shares, Jamaica Broilers traded 18,625 units and gained 25 cents to close at $20.45, Jamaica Producers finished trading at $15.10, with 36,245 units but lost 60 cents in the process, Jamaica Stock Exchange closed at $6.98, with 5,500 shares. JMMB Group ended at $28, with 204,808 shares, Kingston Wharves finished at $45, trading 27,949 stock units, Mayberry Investments settled at $6, with 78,629 units, NCB Financial Group rose by 26 cents and ended trading at $96.25, with 97,448 shares. 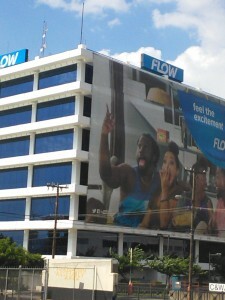 PanJam Investment lost 60 cents and closed at $42, with 5,000 stock units, Radio Jamaica finished with a fall of 5 cents at $1.05, exchanging 50,000 shares. Sagicor Group settled at $37.50, with 28,720 shares and Sagicor Real Estate Fund climbed 50 cents to $15, with 10,344 shares. Scotia Group traded at $52, trading 9,220 units, Seprod finished trading at $34, with 3,735 shares, Supreme Ventures ended at $11.75, with a rise of 5 cents, trading 532,107 shares, Victoria Mutual Investments gained 13 cents and concluded trading at $4.38, with 124,747 stock units and Wisynco Group finished trading at $10.50, with 477,649 units changing hands. 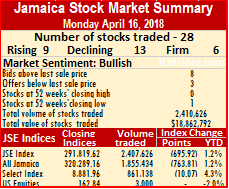 Trading levels rose sharply on the Main Market of the Jamaica Stock Exchange on Monday with 2,407,626 units valued at just $18,652,792 changing hands, compared to 8,083,593 units valued at $186,825,752 changing hands on Friday. The main market closed with just 27 securities changing hands, of which 9 rose, 13 declined and 5 traded firm leading to the JSE All Jamaican Composite Index fell 763.81 points to 320,289.16 and the JSE Index declined by 695.92 points to 291,819.62. In market activity, Berger Paints added 10 cents to end at $18, with 74,122 stock units trading, Carreras fell 10 cents and concluded trading at $10.80 with 11,218 units, Caribbean Cement lost 3 cents and finished trading at $35.77 with 2,291 shares, Ciboney Group settled 12 cents trading 1,349,330 shares, Grace Kennedy ended trading at $48, with 2,181 shares. Jamaica Broilers rose 25 cents and closed trading at $20.50 with 1,035 stock units, Jamaica Producers finished trading losing 19 cents to end at $15.80, with 4,312 units, Jamaica Stock Exchange gained 50 cents and closed at $7, with 1,000 shares, JMMB Group lost 50 cents to end at $27, with 16,603 shares. 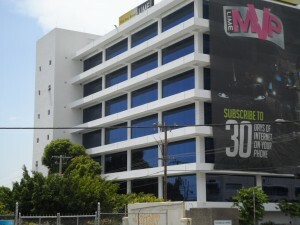 Kingston Properties lost 20 cents and concluded trading at $5.25, with 3,727 shares, Mayberry Investments shed 25 cents and settled at $6, with 8,063 units, NCB Financial Group ended trading losing $1.08 to $95.50 with 18,081 shares, 1834 Investments traded at $1.19 with 16,986 shares after slipping 1 cent. PanJam Investment closed 50 cents lower at $41.50 with 3,960 stock units, Portland JSX ended at $8.01 with a loss of 49 cents after trading 15,883 units, Radio Jamaica rose 4 cents and finished at $1.09 with 45,943 shares, Sagicor Group gained 1 cent and settled at $37.56 with 77,870 shares and Sagicor Real Estate Fund fell 50 cents to $14.50 with 13,983 shares. Salada Foods added 10 cents and ended trading at $11.20 with 2,940 stock units, Scotia Group traded 164,153 units, rising 5 cents to $50.20 in the process, Seprod fell 10 cents and finished trading at $35.40 with 118 shares, Supreme Ventures ended at $11.65 with 10,500 shares after losing 5 cents, Victoria Mutual Investments rose 5 cents and concluded trading at $4.20, with 191,987 stock units and Wisynco Group rose 27 cents and ended at $10.48 with 119,419 units trading. In the main market preference segment, JMMB Group 7.25% finished trading at $1.50, with 100 units and JMMB Group 7.5% closed at $1, with 240,686 shares changing hands. 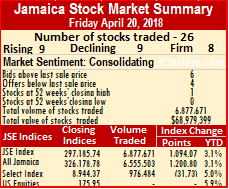 Trading levels rose sharply on the Main Market of the Jamaica Stock Exchange on Friday with 8,083,593 units valued at $186,825,752 changing hands, compared to 4,713,225 units valued at $80,181,699 changing hands on Thursday. The main market closed with 21 securities changing hands, the same as on Thursday of which 10 rose, 5 declined and 6 traded firm leading to the JSE All Jamaican Composite Index dived by 1,552.80 points to 321,052.97. The JSE Index dropped 1,414.78 points to 292,515.54 on Friday. In market activity, Berger Paints ended with a loss of 30 cents at $17.90, with 3,073 stock units, Carreras concluded trading 30 cents higher at $10.90, with 219,500 units, Caribbean Cement finished 30 cents higher at $35.80, with 26,800 shares, Ciboney Group gained 1 cent to end at 12 cents, with 1,258,000 shares trading, Grace Kennedy ended trading at $48, with 24,135 shares. 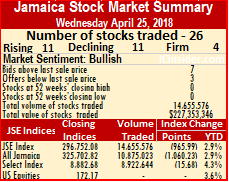 Jamaica Broilers traded with a loss of 25 cents at $20.25, with 46,838 stock units, Jamaica Producers finished trading 58 cents higher at $15.99, with 2,014,107 units, Jamaica Stock Exchange closed at $6.50, with 56,585 shares, JMMB Group ended 50 cents higher at $27.50, with 31,989 shares. Kingston Properties concluded trading with a loss of 35 cents at 52 weeks’ low of $5.45, with 12,000 shares, Kingston Wharves finished 99 cents higher at $40, with 3,363,504 stock units, NCB Financial Group ended trading gaining 6 cents to end at $96.58, with 41,945 shares, PanJam Investment closed at $42, with 981 stock units. Sagicor Group settled with a loss of 5 cents at $37.55, with 71,388 shares and Sagicor Real Estate Fund settled at $15, with 53,000 shares. Scotia Group traded with a loss of 1.85 cents at $50.15, with 113,898 units, Supreme Ventures ended 17 cents higher at $11.70, with 122,713 shares, Victoria Mutual Investments concluded trading 5 cents higher at $4.15, with 95,150 stock units and Wisynco Group finished 6 cents higher at $10.21, with 41,525 units. In the main market preference segment, Jamaica Money Market 7.5% fell 5 cents to $1.90, with 466,462 stock units and Proven Investments 8.25% settled at $5.15, with 20,000 units changing hands. 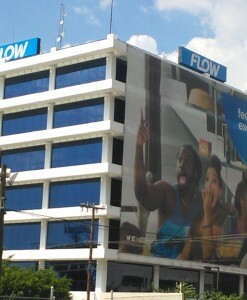 Cable & Wireless was delisted from trading on the Jamaica Stock Exchange at the close of the market on Wednesday, ending more than 30 years of trading after it was listed in 1988 as Telecommunication of Jamaica. Overall trading accounted for 4,713,225 units valued at $80,181,699, compared to 22,695,573 units valued at $68,289,794 changing hands on Thursday. 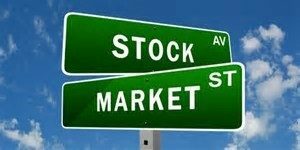 The main market closed with 26 securities changing hands, the same as on Wednesday of which 14 rose, 9 declined and 3 traded firm leading to the JSE All Jamaican Composite Index dived by 1,840.39 points to 322,605.77. The JSE Index dropped 1,676.81 points to 293,930.32 on Thursday. In market activity, Barita Investments closed at $9.50, with 5,000 shares, Berger Paints ended at $18.20, with 36,731 stock units, Carreras concluded trading with a loss of 30 cents at $10.60, with 79,983 units, Caribbean Cement finished with a loss of 18 cents at $35.50, with 46,133 shares, Ciboney Group settled with a loss of 4 cents at $0.11, with 100,000 shares. 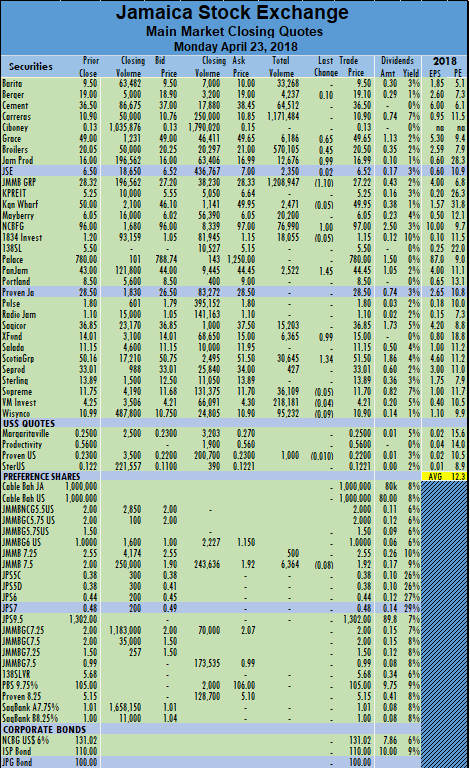 Grace Kennedy ended trading at $48, with 51,258 shares, Jamaica Broilers traded with a loss of 50 cents at $20.50, with 417,859 stock units, Jamaica Producers finished trading 1 cent higher at $15.41, with 89,331 units, Jamaica Stock Exchange closed with a loss of 47 cents at $6.50, with 87,853 shares. JMMB Group ended 98 cents higher at $27, with 44,688 shares, Kingston Properties concluded trading at $5.80, with 2,000 shares, Kingston Wharves finished with a loss of 99 cents at $39.01, with 134,108 stock units, Mayberry Investments settled with a loss of 17 cents at $6.25, with 4,650 units. NCB Financial Group ended trading at $96.52, with 87,672 shares, 1834 Investments traded with a loss of 1 cent at $1.20, with 4,318 shares, PanJam Investment closed with a loss of 1 cent at $42, with 161,331 stock units, Pulse Investments concluded trading with a loss of 17 cents at $1.53, with 149,544 shares. Radio Jamaica finished with a loss of 1 cent at $1.05, with 230,083 shares, Sagicor Group settled 5 cents higher at $37.60, with 148,536 shares, Sagicor Real Estate Fund settled with a loss of 20 cents at $15, with 47,741 shares changing hands. Scotia Group traded at $52, with 142,073 units, Seprod finished trading with a loss of 25 cents at $35.50, with 14,373 shares. 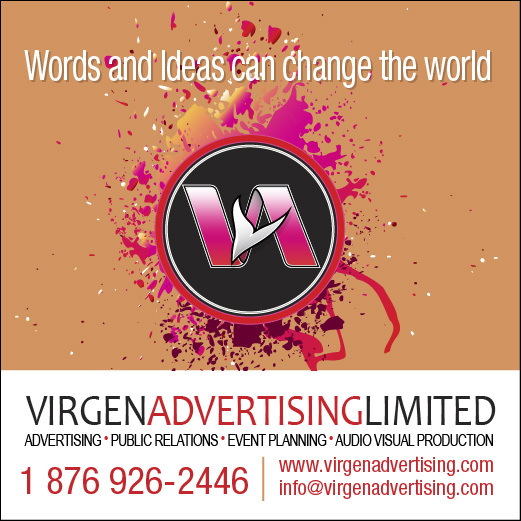 Sterling Investments closed with a loss of 1 cent at $13.89, with 3,500 shares, Supreme Ventures ended with a loss of 17 cents at $11.53, with 804,931 shares, Victoria Mutual Investments concluded trading 10 cents higher at $4.10, with 139,875 stock units and Wisynco Group finished trading with a loss of 35 cents at $10.15, with 1,679,654 units trading. 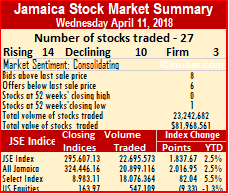 Trading on the Jamaica Stock Exchange main market ended with the JSE All Jamaican Composite Index recovering an additional 2,016.95 points to close at 324,446.16 on Wednesday after regaining 3,026.80 of the nearly 7,000 points lost on Tuesday to end at 322,429.21 as advancing stocks edged out declining ones. The JSE Index regained an added 1,837.67 points to end at 295,607.13 after rising 2,757.76 on Wednesday in clawing back from more than 6,000 points plunge on Tuesday. At the close, 28 securities traded, the same number as on Tuesday and ended with the prices of 13 stocks rising, 10 falling and 5 trading firm, in the main and US dollar markets. Cable & Wireless Head quarters. At the close of trading, Jamaica Broilers rose 99 cents to end at $21, Grace Kennedy lost 96 cents to $48, Kingston Wharves rose $1.48 to $40, NCB Financial Group traded with a loss of 99 cents at $96.52 and Scotia Group recovered $1.50 to $52. Main market activity ended with 22,695,573 units valued at over $68,289,795 compared to 84,503,992 units valued at $180,560,263 on Tuesday. At the close of trading, Cable & Wireless closed with 16,941,044 shares trading amounting to 74.64 percent followed by Ciboney Group with 3,146,042 units and 13.86 percent and Wisynco Group with 1,207,289 units 5.32 percent. Trading resulted in an average of 872,907 shares valued at $2,626,531, for each security traded, compared to 3,129,777 shares valued at $6,687,417 on Tuesday. The average for the month to date is 1,296,927 shares with a value of $5,228,826 and previously 1,355,881 shares with a value of $ 5,651,699. In contrast, March closed with an average of 626,526 units with an average value at $20,492,207 for each security traded. The US dollar market closed on Wednesday with Proven Investments trading 547,109 units valued at over $109,430 and closed with a loss of 2 cents at 20 US cents. Trading ended with the market index falling 9.33 points, to close at 163.97. IC bid-offer Indicator| At the end of trading, the Investor’s Choice bid-offer indicator reading shows 8 stocks ended with bids higher than their last selling prices and 6 with a lower offers. For more details of market activities see – Cable & Wireless grabs 75% of JSE trades – Wednesday. C&W traded the most shares on Wednesday with the company trying to buy up shares on the market ahead of delisting. Cable & Wireless dominated trading for the second on Wednesday, accounting for just under 75 percent or 19 million units of the total volume traded, as the controlling interest in the company prepared for the company to exit the Jamaica Stock Exchange. Overall trading accounted for 22,695,573 units valued at $68,289,794 down from 84,503,992 units valued at $180,560,263 that changed hands on Wednesday. The main market closed with 26 securities changing hands, of which 14 rose, 9 declined and 3 traded firm leading to the JSE All Jamaican Composite Index recovered another 2,016.95 points to end at 324,446.16 after recovering 3,026.80 of the nearly 7,000 points lost on Tuesday. 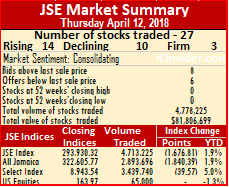 The JSE Index regained an additional 1,837.67 points to close at 295,607.13 on Wednesday on top of the 2,757.76 regained on Wednesday of the more than 6,000 points plunge on Tuesday. In market activity, Barita Investments closed 50 cents higher at $9.50, with 36,518 shares changing hands, Berger Paints ended 47 cents higher at $18.20, with 800 stock units, Cable & Wireless concluded trading at $1.45, with 16,941,044 units, Carreras finished 40 cents higher at $10.90, with 147,796 shares, Caribbean Cement settled 15 cents higher at $35.68, with 24,015 shares. 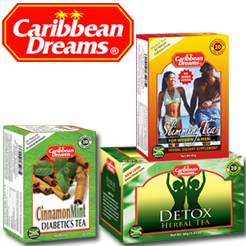 Ciboney Group ended trading 1 cent higher at $0.15, with 3,146,042 shares, Grace Kennedy traded with a loss of 96 cents at $48, with 179,515 stock units, Jamaica Broilers finished trading 99 cents higher at $21, with 34,243 units, Jamaica Producers closed with a loss of 10 cents at $15.40, with 3,000 shares. 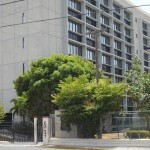 Jamaica Stock Exchange ended with a loss of 3 cents at $6.97, with 3,778 shares, JMMB Group concluded trading with a loss of 19 cents at $26.02, with 20,137 shares, Kingston Properties finished with a loss of 84 cents at a 52 weeks’ low of $5.80, with 18,273 stock units, Kingston Wharves settled $1.48 higher at $40, with 6,794 units. Mayberry Investments ended trading 42 cents higher at $6.42, with 30,170 shares, NCB Financial Group traded with a loss of 99 cents at $96.52, with 121,296 shares, 1834 Investments finished trading 2 cents higher at $1.21, with 15,000 shares, PanJam Investment ended 5 cents higher at $43, with 3,319 units. Portland JSX concluded trading at $8.50, with 1,200 shares, Pulse Investments finished with a loss of 25 cents at $1.70, with 33,958 shares, Radio Jamaica settled with a loss of 4 cents at $1.06, with 23,260 shares, Sagicor Group ended trading 19 cents higher at $37.55, with 38,333 stock units. Scotia Group finished trading $1.50 higher at $52, with 13,123 shares, Seprod closed 25 cents higher at $35.75, with 2,347 shares, Supreme Ventures concluded trading with a loss of 15 cents at $11.70, with 55,155 stock units, Victoria Mutual Investments finished with a loss of 17 cents at $4, with 589,168 units and Wisynco Group settled 15 cents higher at $10.50, with 1,207,289 shares changing hands. 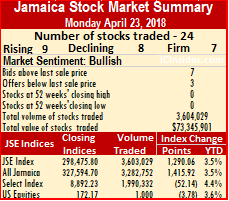 Trading on the Jamaica Stock Exchange main market ended with the JSE All Jamaican Composite Index recovering 3,026.80 of the nearly 7,000 points lost on Monday to end at 322,429.21 as advancing stocks edged out declining ones. The JSE Index regained 2,757.76 of the more than 6,000 points plunge on Monday, to close at 293,769.46. At the close with 28 securities traded, the same number as on Monday. Trading ended with the prices of 13 stocks rising, 10 falling and 5 trading firm, in the main and US dollar markets. At the close of trading, Caribbean Cement lost $2.37 to end at $35.53, Grace Kennedy rose 96 cents to $48.96 and Scotia Group fell $1.50 at $50.50. Main market activity ended with 84,503,992 units valued at $180,560,263 compared to 5,325,114 units valued at $49,013,254 on Monday. At the close Cable & Wireless with 80,371,757 units 95.11 percent, followed by Carreras with 1,686,921 shares and Scotia Group with 544,473 stock units. Trading resulted in an average of 3,129,777 shares valued at $6,687,417, for each security traded, compared to 190,183 shares valued at $1,750,473 on Monday. The average for the month to date is 1,355,881 shares with a value of $5,441,440 and previously 1,056,536 shares with a value of $5,441,440. In contrast, March closed with an average of 626,526 units with an average value at $20,492,207 for each security traded. The US dollar market closed on Tuesday with 1,500 units valued at US$1,500 as JMMB 7.5 % preference share ended closed at US$1 trading 1,500 stock units. Trading ended, leaving the market index unchanged at the close at 173.30. IC bid-offer Indicator| At the end of trading, the Investor’s Choice bid-offer indicator reading shows 8 stocks ended with bids higher than their last selling prices and 3 with a lower offers. For more details of market activities see – Cable & Wireless corners 95% of JSE – Tuesday.